Small Power Scooters are easier to maneuver and are a sporty solution. 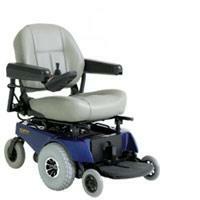 Power wheelchairs are a great solution for comfort and easier maneuvering. We are pleased to be able to say that for over 11 years, we have been working with individuals, conventions, association meetings, expositions, hotels and other events in the Dallas metroplex with great success and consumer satisfaction. Often we are told, by the people who have obtained our equipment, how much it meant to them because they did not have to struggle to get around; therefore, enabling them to make the most of their experience. Whether you are an individual or a large organization, our goal is to meet your needs so satisfactorily and efficiently that you will feel confident in returning to us in the future. We believe that you will find that our customer service and top quality rental mobility equipment is unparalleled. Please give us the opportunity to prove how effective we can be. We look forward to hearing from you! We would love to make a difference for you.